This historically inspired Middle Ages Manganese Broadsword is a must-have collectible piece for the historic enthusiast. It is also great for theatrical productions and re-enactment festivals. The 30.5 in. blade is crafted of thick stainless steel with a manganese finish for aged, weathered look. The cord handl wrappings provide a firm grip, and the pommel and hand guard add even more character to this sword. 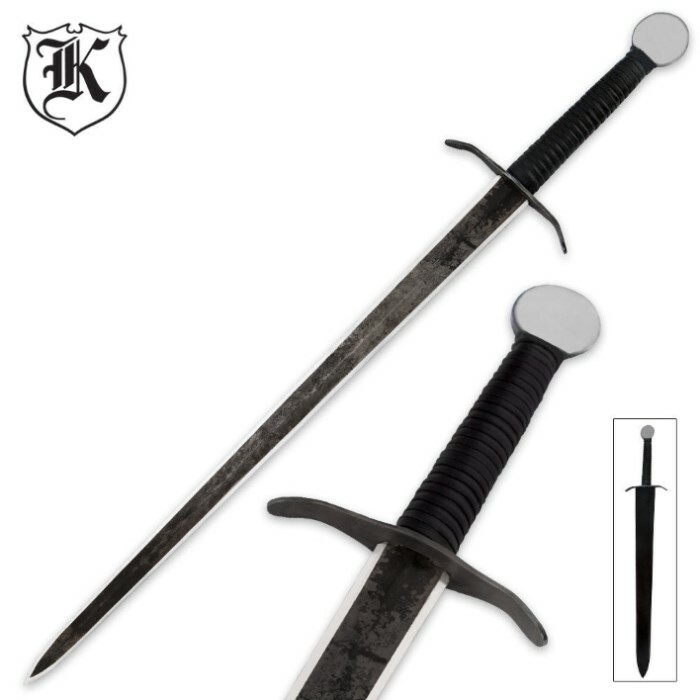 Add a medieval edge to your collection today with this broadsword. I just purchased this sword because the price was reduced and it was on sale, wasn't expecting much, I was very pleasantly surprised when it arrived. I give it 5 stars, very sturdy full tang, stiff and solid, needs some sharpening and the black manganese coating needs some cleaning maybe even some sanding but the blade is awesome, the steel is what counts and this has the feel of a much higher priced sword. I think I'll buy another one and keep one in mint condition and use the other one for fun. Best inexpensive broadsword blade yet. This sword has an excellent blade. Great looking too. Mine came semi sharp. However, the handle is crap. It came with cheap pleather wrapping, which I threw away. The wood shifted side to side and up and down. So I refitted the wood, wrapped it tight with paracord, and wrapped it all with electrical tape. Now it's tight enough to handle swinging and striking. Tested it on milk jugs and juice cartons and it cuts pretty well. The handle held up well too. Now that I fixed the handle, it's a battle ready weapon. Well balanced too. Thanks BudK! Well balanced and well built. Handle is solidly wrapped and big enough for hand-and-a-half work; light enough for one handed use, but heavy enough for two handed strokes. Comes unsharpened, and have not tested how well it takes an edge, but not fully blunted like a stage combat weapon. For the price an amazing find. I gotta say this one really surprised me. nice weight good size. I will point out the pommel is only tack welded on. During the shipping the pommel came off. I did receive a new one and same exact problem, but the rest of the sword is solid. Its gotten some abuse and I am really satisfied with it.